African forest elephants (Loxodonta cyclotis) are in trouble, but this may not be news to you. They are threatened by habitat loss and fragmentation, as well as poaching for the ivory trade. Rather than beat this information over everyone’s heads, scientists are trying to get us to understand why we will miss the elephants when they are gone. This is exactly what Poulsen et al. have done in a 2018 review paper published in Conservation Biology. 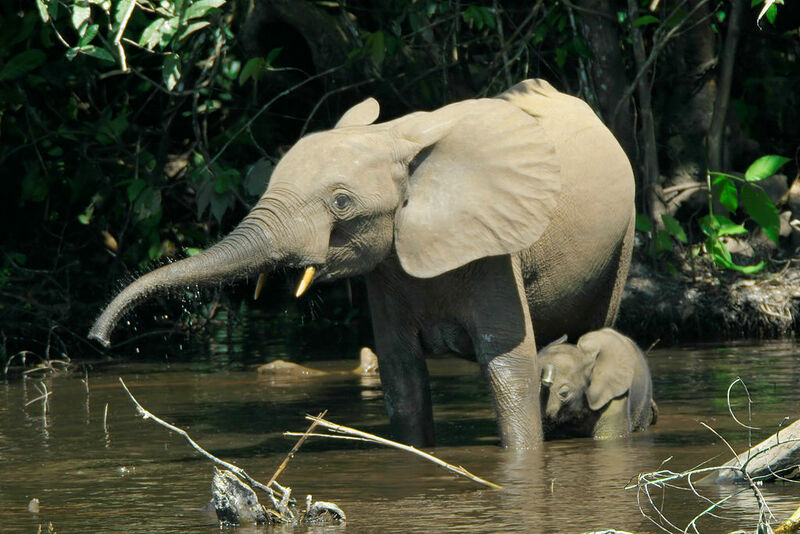 The authors appeal to the practicality of conserving African forest elephants by focusing on the unique ecosystem services they provide and the impact their extinction will have on their ecosystem. Figure 1. Historical timeline of threats to African forest elephants and estimated population sizes of both forest and savanna elephants. Source: provided by C. L. Nuñez (modified). A great way to prove that a species is valuable to people, economically or otherwise, is by listing the ecosystem services they provide. These are actions or processes a plant or animal species undertakes that are beneficial to humans. Many species inadvertently provide ecosystem services simply by existing and functioning within their ecosystem. A step above providing ecosystem services is being an ecosystem engineer. Ecosystem engineers, such as beavers, ants, and elephants, have a disproportionately large impact on their ecosystem and many of the other organisms living in it. They are called “engineers” because they physically alter their habitat, as African forest elephants do when they trample young trees while moving within the forest. Poulsen et al. reviewed studies detailing the impact African forest elephants have on forest composition and structure. They identified three important ecosystem services these elephants provide: seed dispersal, nutrient cycling and herbivory/physical damage. African forest elephants are not picky eaters; they feed on the fruits and leaves of many different types of plants. Being larger animals, they are especially adept at feeding on large-seeded fruits and dispersing the seeds a long distance away from their source. This make the elephants important for the reproductive success of large-seeded plant species. Losing the elephants could lead to a shift towards seed dispersal of smaller-seeded plants by smaller animals and through abiotic means, such as wind. These smaller-seeded plants will grow into smaller trees, which the authors of the review paper argue will decrease overall forest carbon sequestration. In addition, smaller animals may not be able to disperse seeds the long distances that forest elephants do, which could result in high-density clusters of seedlings and reduced survival. Since elephants eat a lot, it’s a given that they also produce heaps of wonderful, nourishing excrement. They return the many nutrients they obtain from eating a wide variety of plant species to the forest soil, effectively performing nutrient cycling. Without the excrement that comes with African forest elephants, soils will be deprived of the nutrients they provide. A not-so-convincing argument the authors make in regard to ecosystem-provisioning by African forest elephants is that the damage they do to their forest habitat — that is, feeding on plants and trees and trampling seedlings — is beneficial. The physical damage these elephants do results in the growth of fast-growing, light-tolerant tree species. Get rid of the elephants, and what you are left with is a higher overall density of trees that have escaped being trampled while they were seedlings. These trees will consist of more slow-growing, shade-tolerant species. They will be smaller because they come from smaller seeds. Over time, the forest will become crowded with trees, leading to increased competition for water and soil nutrients. These changes may not be catastrophic, however, as a forest will still thrive without the herbivory and physical damage caused by forest elephants; it will just look different. It seems that the elephants prevent their forest habitat from progressing into later stages by trampling smaller trees and plants and creating open spaces within the forest. Older forests, which are more robust and can sustain a greater diversity of wildlife, typically contain the slow-growing, shade-tolerant species that thrive in the absence of elephants. This is not to say that we’d rather do away with the elephants, but the physical damage they inflict on their habitat is maybe not the strongest justification for their conservation. Figure 2. Ecosystem services provided by African forest elephants (in color-filled rectangles) and the impact of elephant removal on these services (arrows); short- and long-term changes (in color-bordered rectangles) that will occur in relation to each ecosystem service after elephant extinction. Source: provided by C. L. Nuñez. The fact of the matter is that there is no way you can lose such a large species from an ecosystem without repercussions. The loss of African forest elephants is likened to the megafauna extinction of the Pleistocene, which had cascading effects on vegetation. Without elephants, African forests may look more like the Neotropical forests that have long lost their largest animals. Globally, 60% of the remaining large-bodied herbivores (>100 kg) are threatened, so we may well be facing another Pleistocene extinction. Focusing on the services African forest elephants provide may be the appropriate change of tack for persuading the public and policy-makers that these elephants must be protected. Their protection entails, first of all, recognizing forest elephants as a separate species from savanna elephants (Loxodonta africana) to change their conservation status to critically endangered. This could potentially lead to more bans on the ivory trade. Poulsen et al. have presented a last call for African forest elephants. Who will hear it? ← Is there enough dirt in the Mississippi River to save the delta?